A Scene From Danny's Lifelong Appreciation of Vincent Price: It is summer 1996, and I'm collapsed in my dorm room at Texas A&M, where I've stayed for summer school. I've been out drinking with friends, and although I'm usually a very friendly drunk, I am an angry drunk on this particular Friday night. I'm mulling over stupid 2 AM ideas like calling ex-girlfriends to give them a piece of my mind. Instead, I turn on the TV just in time to catch the last thirty seconds of a Kids in the Hall rerun on Comedy Central, which makes me angry all over again. But before I have a chance to take it out on my TV, the most marvelously insane opening credits I've ever seen start to play. The movie is Dr. Goldfoot and the Bikini Machine, and it is so strange that it lulls me back to my happy place, and into a peaceful sleep. In The House on Haunted Hill, Price plays a millionaire who rents a supposedly haunted house for a night, and hosts a ghost party for his wife and five strangers. The house has been the scene of seven murders, including the father and brother of the house's current owner, who is one of the guests at the party. Any of the guests who stays the whole night will be awarded $10,000 in the morning. As the night progresses, strange events begin to befall members of the group. Not everybody makes it through the night, but the ones who don't make it are not the ones who you are led to believe. I think I would have liked this movie better if I hadn't already seen the 1999 remake of it. Don't get me wrong, the remake is not a good movie. You know, I'm just going to have to go ahead and spoil both movies to explain what I'm going for here. Oh, don't look at me like that - one's been out for 13 years, and the other for 53 years, so you've had plenty of time to see them both. In the remake, the basic premise is the same, but there's some doubt at first about whether supernatural elements are at work. By the end of the movie, there's no doubt anymore - spirits are definitely moving in the house. In the original, there are several scenes where you think that something ghostly may be happening only for the curtain to be pulled back and reveal that it was all a part of somebody's scheme. I would have liked it better, and been more scared, if they had at least left the possibility that it could have been supernatural. And oh mercy is the last line of the original a corny one. 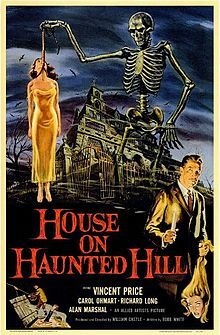 Not a bad movie overall, and I'm glad to finally have seen something from the great William Castle's oeuvre. I give it three skeleton puppets out of five. Tomorrow night: Tales of Terror, available (you guessed it) on Netflix instant streaming!